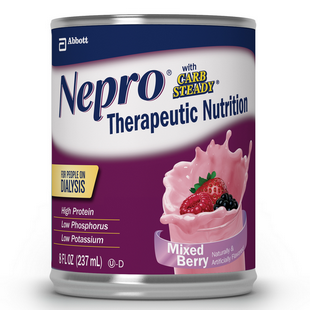 NEPRO WITH CARBSTEADY® is therapeutic nutrition specifically designed to help meet the nutritional needs of patients on dialysis (Stage 5 chronic kidney disease). For tube or oral feeding. For supplemental or sole-source nutrition. Use under medical supervision. In a study of NEPRO as supplemental nutrition1, patients on dialysis had increased serum albumin, increased serum prealbumin and improved nutritional status (as signified by subjective global assessment). Excellent source of high-quality protein (19.1 g /8 fl oz) to help meet nutritional needs and replace protein lost during dialysis. Vitamin and mineral profile designed for people on dialysis. 1 Caglar K, et al. Kidney Int 2002;62(3):1054-1059. Water, Corn Syrup Solids, Caseinates (Calcium, Magnesium, Sodium), High Oleic Safflower Oil, Canola Oil, Milk Protein Isolate, Sugar, Corn Maltodextrin, Glycerine, Short-Chain Fructooligosaccharides. Less than 1.0% of: Soy Lecithin, Natural & Artificial Flavor, Calcium Citrate, Sodium Citrate, Potassium Citrate, Choline Chloride, Salt, Ascorbic Acid, L-Carnitine, Taurine, Zinc Sulfate, d-Alpha-Tocopheryl Acetate, Ferrous Sulfate, Niacinamide, FD&C Red #3, Calcium Pantothenate, Pyridoxine Hydrochloride, Manganese Sulfate, Cupric Sulfate, Thiamine Chloride Hydrochloride, Riboflavin, FD&C Blue #1, Vitamin A Palmitate, Magnesium Phosphate, Folic Acid, Chromium Chloride, Biotin, Sodium Molybdate, Potassium Iodide, Sodium Selenate, Phylloquinone, Cyanocobalamin, and Vitamin D3. Water, Corn Syrup Solids, Caseinates (Calcium, Magnesium, Sodium), High Oleic Safflower Oil, Canola Oil, Milk Protein Isolate, Sugar, Corn Maltodextrin, Glycerine, Short-Chain Fructooligosaccharides. Less than 1.0% of: Soy Lecithin, Calcium Citrate, Sodium Citrate, Potassium Citrate, Natural & Artificial Flavor, Choline Chloride, Salt, Ascorbic Acid, L-Carnitine, Taurine, Zinc Sulfate, d-Alpha-Tocopheryl Acetate, Ferrous Sulfate, Niacinamide, Calcium Pantothenate, Pyridoxine Hydrochloride, Manganese Sulfate, Cupric Sulfate, Thiamine Chloride Hydrochloride, Riboflavin, Vitamin A Palmitate, Magnesium Phosphate, Folic Acid, Chromium Chloride, Biotin, Sodium Molybdate, Potassium Iodide, Sodium Selenate, Phylloquinone, Cyanocobalamin, and Vitamin D3. Water, Corn Syrup Solids, Caseinates (Calcium, Magnesium, Sodium), High Oleic Safflower Oil, Canola Oil, Milk Protein Isolate, Sugar, Corn Maltodextrin, Glycerin, Short-Chain Fructooligosaccharides. Less than 1.0% of: Soy Lecithin, Natural & Artificial Flavor, Calcium Citrate, Sodium Citrate, Potassium Citrate, Choline Chloride, Salt, Cellulose Gel, Ascorbic Acid, L-Carnitine, Taurine, Zinc Sulfate, d-Alpha-Tocopheryl Acetate, Cellulose Gum, Ferrous Sulfate, Niacinamide, Calcium Pantothenate, Magnesium Phosphate, Pyridoxine Hydrochloride, Manganese Sulfate, Copper Sulfate, Thiamine Hydrochloride, Riboflavin, Vitamin A Palmitate, Folic Acid, Chromium Chloride, Biotin, Sodium Molybdate, Potassium Iodide, Sodium Selenate, Phylloquinone, Vitamin B12, and Vitamin D3. Water, Corn Syrup Solids, Caseinates (Calcium, Magnesium, Sodium), High Oleic Safflower Oil, Canola Oil, Milk Protein Isolate, Sugar, Corn Maltodextrin, Glycerin, Short-Chain Fructooligosaccharides. Less than 1.0% of: Soy Lecithin, Natural & Artificial Flavor, Calcium Citrate, Sodium Citrate, Potassium Citrate, Choline Chloride, Salt, Cellulose Gel, Ascorbic Acid, L-Carnitine, Taurine, Zinc Sulfate, d-Alpha-Tocopheryl Acetate, Cellulose Gum, Ferrous Sulfate, Niacinamide, Red 3, Calcium Pantothenate, Magnesium Phosphate, Pyridoxine Hydrochloride, Manganese Sulfate, Copper Sulfate, Thiamine Hydrochloride, Riboflavin, Blue 1, Vitamin A Palmitate, Folic Acid, Chromium Chloride, Biotin, Sodium Molybdate, Potassium Iodide, Sodium Selenate, Phylloquinone, Vitamin B12, and Vitamin D3. Water, Corn Syrup Solids, Caseinates (Calcium, Magnesium, Sodium), High Oleic Safflower Oil, Canola Oil, Milk Protein Isolate, Sugar, Corn Maltodextrin, Glycerin, Short-Chain Fructooligosaccharides. Less than 1.0% of: Soy Lecithin, Calcium Citrate, Sodium Citrate, Potassium Citrate, Natural & Artificial Flavor, Choline Chloride, Salt, Cellulose Gel, Ascorbic Acid, L-Carnitine, Taurine, Zinc Sulfate, d-Alpha-Tocopheryl Acetate, Cellulose Gum, Ferrous Sulfate, Niacinamide, Calcium Pantothenate, Magnesium Phosphate, Pyridoxine Hydrochloride, Manganese Sulfate, Copper Sulfate, Thiamine Hydrochloride, Riboflavin, Vitamin A Palmitate, Folic Acid, Chromium Chloride, Biotin, Sodium Molybdate, Potassium Iodide, Sodium Selenate, Phylloquinone, Vitamin B12, and Vitamin D3.